Whether your day brings a major catastrophe or a minor inconvenience, it’s easy to grow frustrated and think, “What’s the use?” If you feel like this, you’re not alone. When Jesus came He talked about the principles of the vine and the branches. He made it clear that a connection with me was the only way to get the most out of this life, to “bear fruit.” And he clenches it by saying “apart from me you can do nothing.” A branch can’t exist without the vine that is supplying it with nutrients- it shrivels, and dries out- the branch dies. When you attempt to live life on your own, relying on your own strength it is inevitable that you will run out of steam. Your strength has limits. Your strength fails, mine doesn’t. Your patience wears out, mine won’t. You have needs, I can meet them. You seek rest, I can give it to you. There is only one way to escape the daily grind and that is to make sure you are connected to me. I am the vine I can supply you with the energy, strength, courage, and rest that you need. If you are weary, come to me. Walk with me. Let me refresh you. When you are connected to me (the vine) you’ll find rest for your soul. 1 – Write Matthew 11:28 “Then Jesus said, “Come to me, all of you who are weary and carry heavy burdens, and I will give you rest.” On a piece of paper or make a note of it on your phone. Set it as your goal to memorize this verse this week. 2 – Read John 15:1-17. Stop whatever you are doing and talk with God right now. If you feel burdened by life, tell Him about it. If you need strength, ask for it. If you are looking for rest, take it in him. 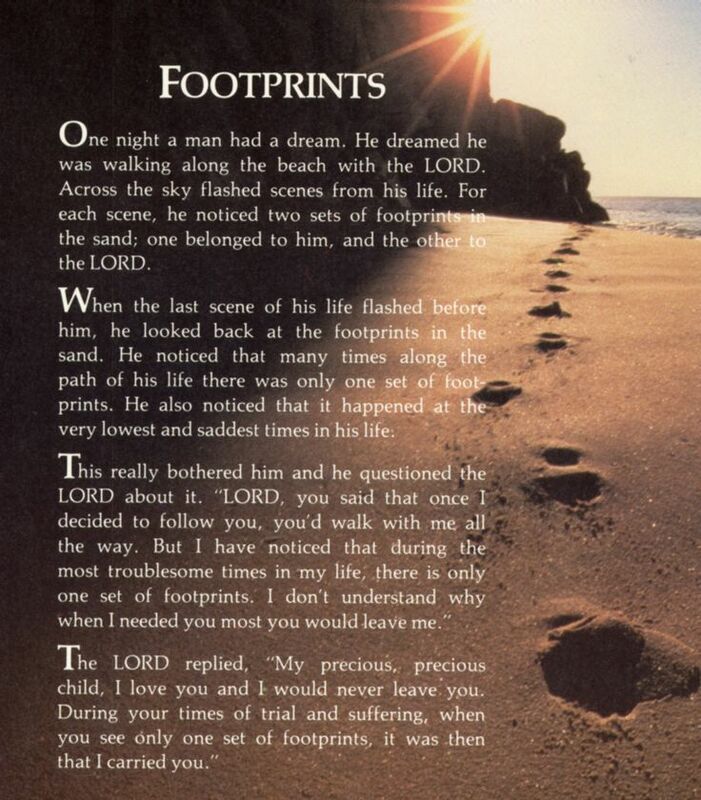 3 – Read the poem Footprints in the Sand.